This sixth article, which is part of the series on Linux device drivers, is continuation of the various concepts of character drivers and their implementation, dealt with in the previous two articles. So, what was your guess on how would Shweta crack the nut? Obviously, using the nut cracker named Pugs. Wasn’t it obvious? <Smile> In our previous article, we saw how Shweta was puzzled with reading no data, even after writing into the /dev/mynull character device file. Suddenly, a bell rang – not inside her head, a real one at the door. And for sure, there was the avatar of Pugs. “How come you’re here?”, exclaimed Shweta. “After reading your tweet, what else? Cool that you cracked your first character driver all on your own. That’s amazing. So, what are you up to now?”, said Pugs. “I’ll tell you on the condition that you do not become a spoil sport”, replied Shweta. “Okay yaar, I’ll only give you pointers”. “And that also, only if I ask for”. “Okie”. “I am trying to decode the working of character device file operations”. “I have an idea. Why don’t you decode and explain me your understanding?”. “Not a bad idea”. With that, Shweta tailed the dmesg log to observe the printk‘s output from her driver. Alongside, she opened her null driver code on her console, specifically observing the device file operations my_open, my_close, my_read, and my_write. Based on the earlier understanding of return value of the functions in kernel, my_open() and my_close() are trivial. Their return types being int and both of them returning zero, meaning success. However, the return types of both my_read() and my_write() are not int, but ssize_t. On further digging through kernel headers, that turns out to be signed word. So, returning a negative number would be a usual error. But a non-negative return value would have an additional meaning. For read it would be number of bytes read, and for write it would be number of bytes written. For understanding this in detail, the complete flow has to be re-looked at. Let’s take read first. So, when the user does a read onto the device file /dev/mynull, that system call comes to the virtual file system (VFS) layer in the kernel. VFS decodes the <major, minor> tuple & figures out that it need to redirect it to the driver’s function my_read(), registered with it. So from that angle, my_read() is invoked as a request to read, from us – the device driver writers. And hence, its return value would indicate to the requester – the user, as to how many bytes is he getting from the read request. In our null driver example, we returned zero – meaning no bytes available or in other words end of file. And hence, when the device file is being read, the result is always nothing, independent of what is written into it. “Hmmm!!! So, if I change it to 1, would it start giving me some data?”, Pugs asked in his verifying style. Shweta paused for a while – looked at the parameters of the function my_read() and confirmed with a but – data would be sent but it would be some junk data, as the my_read() function is not really populating the data into the buf (second parameter of my_read()), provided by the user. In fact, my_read() should write data into buf, according to len (third parameter of my_read()), the count in bytes requested by the user. To be more specific, write less than or equal to len bytes of data into buf, and the same number be used as the return value. It is not a typo – in read, we ‘write’ into buf – that’s correct. We read the data from (possibly) an underlying device and then write that data into the user buffer, so that the user gets it, i.e. reads it. “That’s really smart of you”, expressed Pugs with sarcasm. Similarly, the write is just the reverse procedure. User provides len (third parameter of my_write()) bytes of data to be written, into buf (second parameter of my_write()). my_write() would read that data and possibly write into an underlying device, and accordingly return the number of bytes, it has been able to write successfully. “Aha!! That’s why all my writes into /dev/mynull have been successful, without being actually doing any read or write”, exclaimed Shweta filled with happiness of understanding the complete flow of device file operations. Build the modified null driver (.ko file) by running make. Load the driver using insmod. Unload the driver using rmmod. On cat‘ing /dev/mynull, the output was a non-stop infinite sequence of ‘s’, as my_read() gives the last one character forever. So, Pugs intervenes and presses Ctrl+C to stop the infinite read, and tries to explain, “If this is to be changed to ‘the last character only once’, my_read() needs to return 1 the first time and zero from second time onwards. This can be achieved using the off (fourth parameter of my_read())”. Shweta nods her head to support Pugs’ ego. This entry was posted in Linux Device Drivers and tagged Character Device File Operations, Character Drivers, Device Drivers, LFY, Linux, OSFY on July 1, 2013 by Anil Kumar Pugalia. 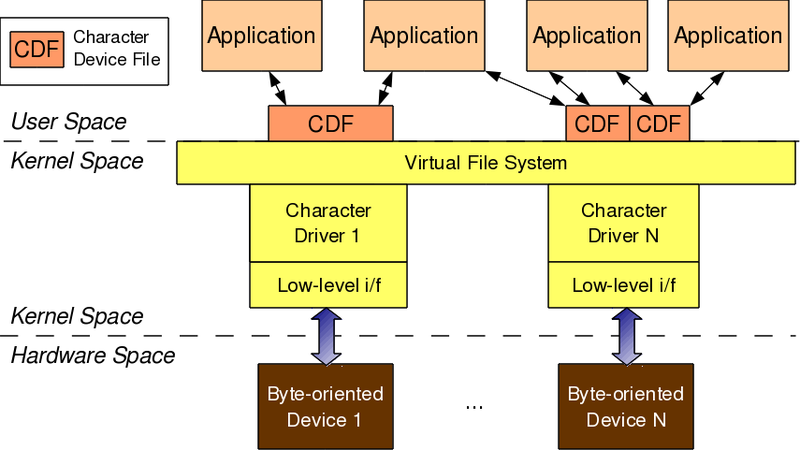 This fifth article, which is part of the series on Linux device drivers, is continuation of the various concepts of character drivers and their implementation, dealt with in the previous article. In our previous article, we noted that even with the registration for <major, minor> device range, the device files were not created under the /dev, rather Shweta had to create them by hand using mknod. However, on further study, Shweta figured out a way for the automatic creation of the device files using the udev daemon. She also learnt the second step for connecting the device file with the device driver – “Linking the device file operations to the device driver functions”. Here are her learnings. Earlier in kernel 2.4, automatic creation of device files was done by the kernel itself, by calling the appropriate APIs of devfs. However, as kernel evolved, kernel developers realized that device files are more of a user space thing and hence as a policy only the users should deal with it, not the kernel. With this idea, now kernel only populates the appropriate device class & device info into the /sys window for the device under consideration. And then, the user space need to interpret it and take an appropriate action. In most Linux desktop systems, the udev daemon picks up that information and accordingly creates the device files. where first is the dev_t with the corresponding <major, minor>. 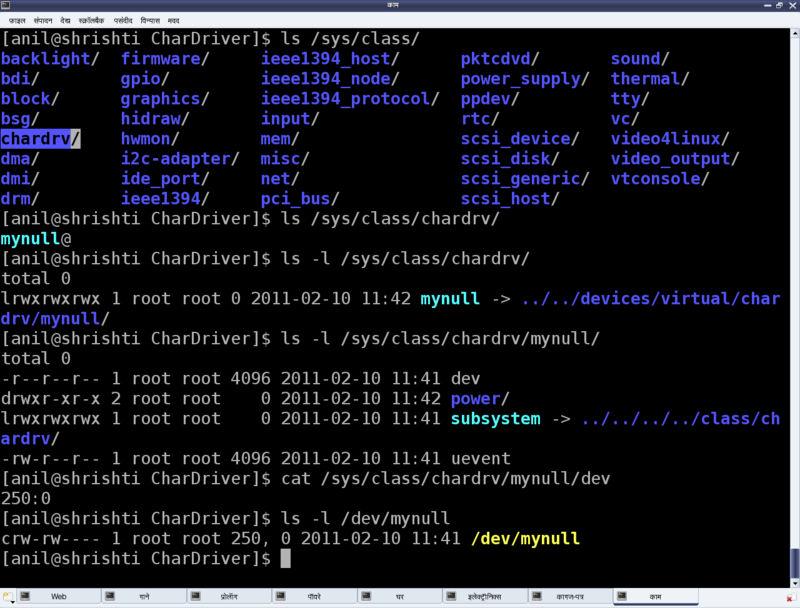 Refer to Figure 9, for the /sys entries created using “chardrv” as the <device class name> and “mynull” as the <device name format>. 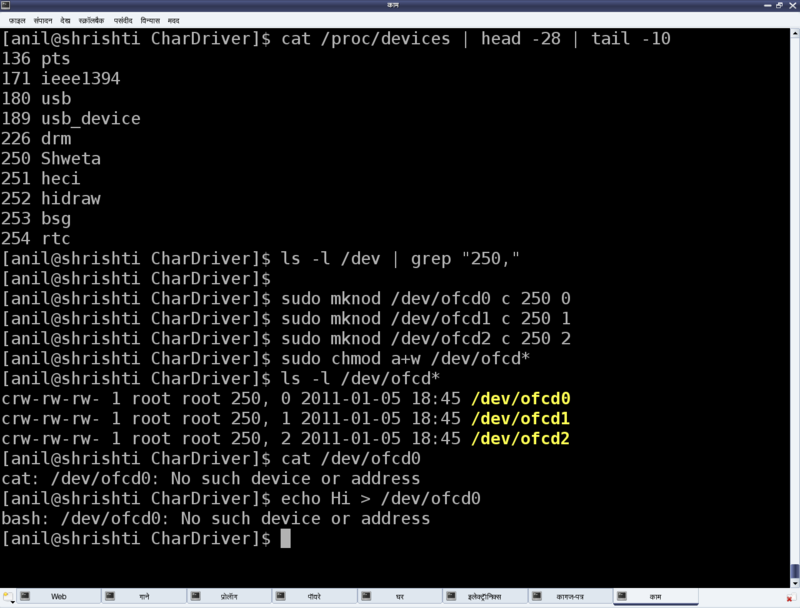 That also shows the device file, created by udev, based on the <major>:<minor> entry in the dev file. Whatever system calls or more commonly file operations we talk of over a regular file, are applicable to the device files as well. That’s what we say a file is a file, and in Linux almost everything is a file from user space perspective. The difference lies in the kernel space, where virtual file system (VFS) decodes the file type and transfers the file operations to the appropriate channel, like file system module in case of a regular file or directory, corresponding device driver in case of a device file. Our discussion of interest is the second case. Now, for VFS to pass the device file operations onto the driver, it should have been told about that. And yes, that is what is called registering the file operations by the driver with the VFS. This involves two steps. (The parenthesised text below refers to the ‘null driver’ code following it.) First, is to fill in a file operations structure (struct file_operations pugs_fops) with the desired file operations (my_open, my_close, my_read, my_write, …) and to initialize the character device structure (struct cdev c_dev) with that, using cdev_init(). The second step is to hand this structure to the VFS using the call cdev_add(). 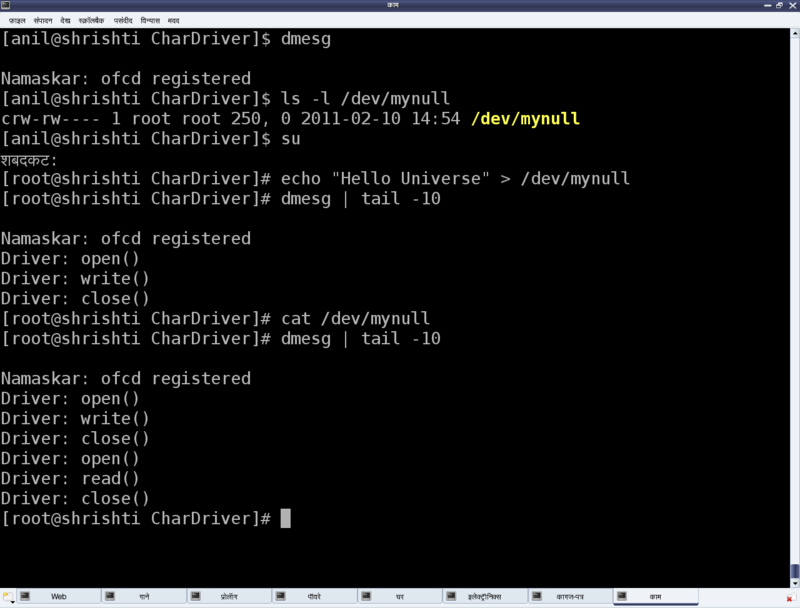 Both cdev_init() and cdev_add() are declared in <linux/cdev.h>. Obviously, the actual file operations (my_open, my_close, my_read, my_write) also had to be coded by Shweta. So, to start with, Shweta kept them as simple as possible, so as to say, as easy as the “null driver”. Build the driver (.ko file) by running make. List the loaded modules using lsmod. List the major number allocated using cat /proc/devices. “null driver” specific experiments (Refer to Figure 10 for details). Shweta was surely happy as all on her own she got a character driver written, which works same as the driver for the standard device file /dev/null. To understand what it means, check for yourself the <major, minor> tuple for /dev/null, and similarly also try out the echo and cat commands with it. But one thing started bothering Shweta. She had got her own calls (my_open, my_close, my_read, my_write) in her driver, but how are they working so unusually unlike any regular file system calls. What’s so unusual? Whatever I write, I get nothing when read – isn’t that unusual, at least from regular file operations’ perspective. Any guesses on how would she crack this nut? Watch out for the next article. For using a fixed major number, you may use register_chrdev_region() instead of alloc_chrdev_region(). Use kernel version >= 2.6.3x for the class_create() and the device_create() APIs to compile properly work as explained. As, before that version they have been rapidly evolving and changing. Kernel APIs (like class_create(), device_create()) which returns pointers, should be checked using IS_ERR macro instead of comparing with NULL, as NULL is zero (i.e. success and not an error). These APIs return negative pointers on error – error code from which could be extracted using PTR_ERR. See the usage in the above example. This entry was posted in Linux Device Drivers and tagged Character Device Files, Character Drivers, Device Drivers, LFY, Linux, OSFY on June 1, 2013 by Anil Kumar Pugalia.